Mussels are common for an appetizer or a snack. 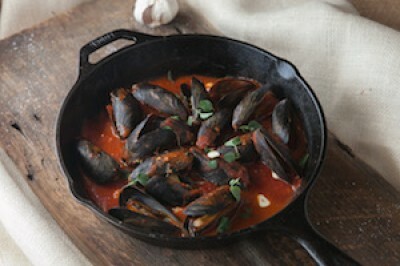 My Nana would make a pan of mussels for a late afternoon meal. Most Italian homes have food going all day and this easy dish is perfect for friends around the table. In a large cast iron pan over medium heat add in olive oil. Once hot add in garlic and red pepper flakes stirring around with a wooden spoon for 30 seconds. Add in wine and diced tomatoes then bring to a boil. Add in mussels, cover and let cook for 6-8 minutes or until they open*. *Discard any mussels that do not open! Serve right out of the pan or transfer to a large bowl.